Simple bungalows on stunning Long Set beach offer unimpeded sea views. 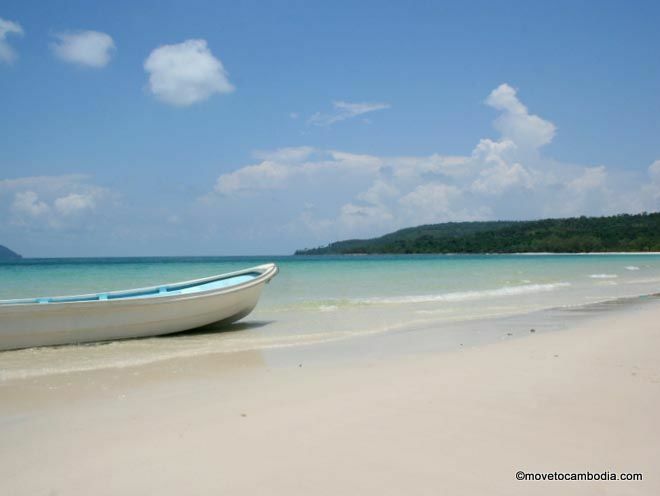 For many years Pura Vita was the only accommodation available on the white sands of gorgeous Long Set Beach, but times are changing and a few more places have been built nearby. Pura Vita didn’t get the memo, though, and their prices are on the high side for what they are actually offering, now that it’s no longer a private beach. Nonetheless, the 19 bungalows offer a relaxed experience with beautiful views of Koh Rong’s blue-green waters. Pura Vita’s beach is picture perfect. Bungalows are simple but feel larger than they appear. 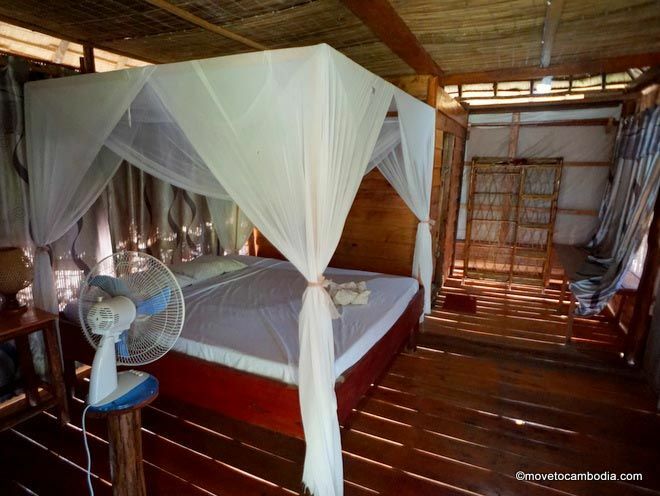 They have either one or two double beds, each with a four- poster- style mosquito net and a fan. Unlike most bungalows on the island, they have actual furniture inside, including a nightstand, desk, and shelving. This may not seem like much, but once you’ve spent a few days on the island with all of your belongings spread out on the floor, you’ll appreciate having somewhere to put your things. Each room has a large balcony with a rattan couch to recline on while enjoying the sea views. The location is the best thing about Pura Vita, and they make the most of it with loungers, tables, and swings from which guests can gaze out onto the spectacular seaside scenery. We will admit that we like this four-poster mosquito net. Pura Vita claims to have internet, but when we visited it was not working. They offer electricity from 4 p.m. to 7 a.m., so you can power the fan through the night, but we note that their neighbor, Reef on the Beach, is able offer 24-hour electricity in bungalows that are half the price. Pura Vita used to be Italian-owned, but after the former owners were run off the island after a local dispute their erstwhile Cambodian partner took over. Although some of the Italian menu remains, we didn’t dare try it. Prices at the restaurant are on the high side, and when we ate there a simple pancake took nearly an hour to arrive at our table, even though we were the only guests there. 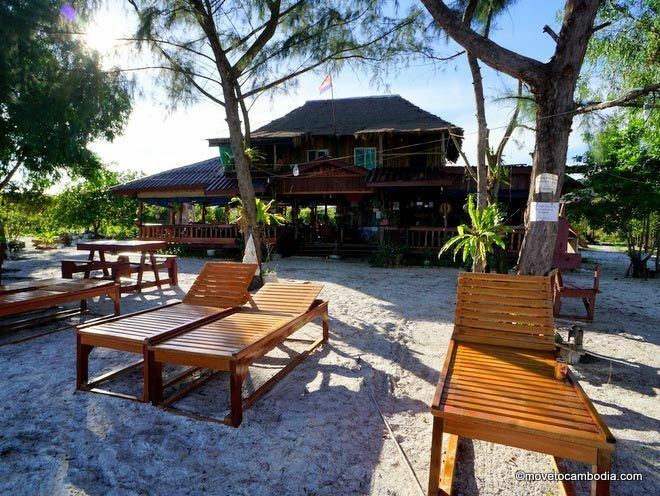 Next door, Long Set Resort has a restaurant serving inexpensive and tasty Cambodian and Western dishes, so if you stay at Pura Vita we’d recommend moseying down the beach for meals. Lounge around at Pura Vita. We assume once they cotton on to the fact that they have competition they will lower their prices. Prices include breakfast. Bookings are available online, on Booking.com and Agoda.